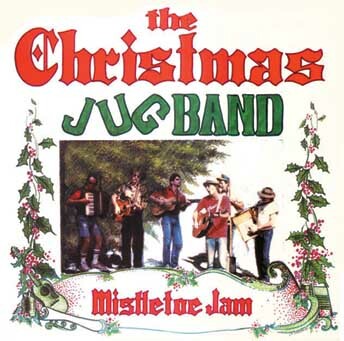 The Christmas Jug Band: Music: "Mistletoe Jam"
New re-issue on CD by Globe Records of this Offbeat Holiday Classic - features many more pictures than previous release. On sale now! "Clearly the alternative Christmas record of the year. The fun and the funk rollick along and a good time is sure to be had by all." This internationally acclaimed eleven song soundtrack for the season was produced by Tim Eschliman and Dan Hicks and was recorded in 1986 in the San Francisco area at Globe Studios, Mill Valley. The album was originally released in green vinyl and cassette on the Globe Records label in 1987 and re-released in the CD, cassette, and black vinyl formats on Relix Records out of Brooklyn, New york in 1988. One cut from this album, "Somebody Stole My Santa Claus Suit" is featured as the lead-off track on the offbeat Christmas compilation titled "Bummed Out Christmas" on Rhino Records. "Mistletoe Jam" features Dan Hicks: vocals, guitar, percussion; Tim Eschliman (from Rhythmtown-Jive, Etta James, Commander Cody, Jesse Colin Young, The Moonlighters): vocals, guitar, percussion; Gregory Leroy Dewey (Mad River, Country Joe McDonald, Marty Balin): vocals, washboard, trap drums; Paul Wenninger: washtub bass, vocals; Austin deLone (Eggs Over Easy, The Moonlighters, Fabulous Thunderbirds, Elvis Costello): vocals, accordion, piano; Ken "Turtle" VanDemarr (Dan Hicks): vocals, lead guitar; Paul Rogers (Baxter Brothers, Those Darn Accordions, Nick Gravenites): piano, vocals; Jim Rothermel (Jesse Colin Young, Van Morrison): clarinets, saxophones, harmonica, recorder; as well as various guests artists. The Christmas Jug Band was originated around 1976 on Christmas Eve at the infamous Old Mill Tavern in Mill Valley, California. The group has performed every Christmas Eve since and at the closure of the Old Mill, the tradition has been carried on each subsequent year at Sweetwater, located right up the street. The Christmas Jug Band, no newcomer to the local parades and marching half-time shows, is an all acoustic tongue-in-cheek collaboration concerning itself with a high degree of holiday spirit and revelry. PLAY LIST - "MISTLETOE JAM"